It wasn't so long ago that Kitovi was learning how to eat fish after months of nursing her mom's milk. But just like human babies, eating solid food was a skill that took some practice. It was up to her mom, Ursula, to show her the ropes. Here's a video of Ursula tossing her food about, ripping the fish into pieces while Kitovi follows her lead. One indication that this was a teaching session was because of the type of fish being tossed: herring. Ursula usually doesn't give herring the time of day. But here she was throwing it about, mouthing it and showing some interest. The trainers know better. This was likely Ursula tolerating her least-favorite fish just to show Kit how to eat fish. Kit is now eating fish like the fur seal she is. 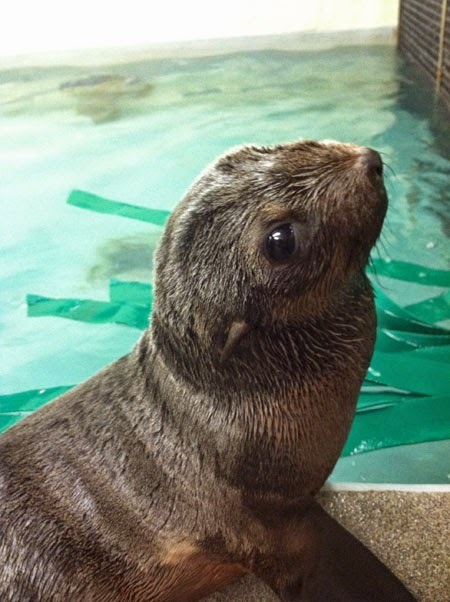 Look for her and the band of frisky youngsters in the marine mammal center! There's Leu, Flaherty, Chiidax, Zoe and Sierra. Of course, don't forget about the wise elders of the group: Isaac, Ursula and Roxie.